Weber Marine carburetors Mercruiser kit # 809064 Carter 9000 series AFB Edelbrock 4 BBL. Fit:Edelbrock Carb numbers:1400 1404 1405 1406 1407 1409 1411 1477 1801 1802 1803 1804 1805 1806 1825 1826 1812 1813. 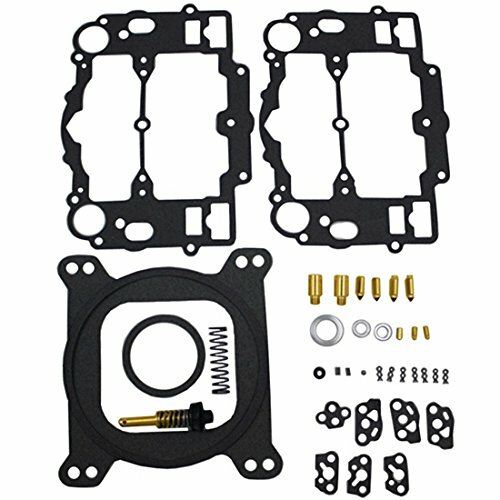 For one New complete Carburetor Kit for Edelbrock 4 bbl Carburetors as well as 809064 Carter 9000 series AFB(9900 9903 9904 9905 9906 9907 9909 9910 9913 9962 9966). Interchanges with Edelbrock #1477 plus includes the high performance pump and high flow needle and seats. Compatible with Ethanol Fuel & Race Fuel. For all Automotive 500 600 650 700 750 & 800 CFM. If you have any questions about this product by iFJF, contact us by completing and submitting the form below. If you are looking for a specif part number, please include it with your message.